NEW YORK (CBSNewYork) – Amazon has made it official. New York City is one of two locations for the company’s second headquarters, Amazon announced Tuesday. The other location will be in Arlington, Virginia. News the corporate giant was eyeing the Big Apple broke last week. The new headquarters is expected to be built in the area of Vernon Boulevard and 44th Drive, in an area sometimes called Anable Basin. This ends a yearlong search that generated interest from cities and towns across the country. The tech giant says the move will bring more than 25,000 jobs to Queens. Amazon said it expects to invest $2.5 billion in the Long Island City headquarters, which will encompass 4 million square feet of office space, with the possibility of expanding to 8 million. Gov. Andrew Cuomo said the average salary of the Amazon employees in Queens will be $150,000. Amazon estimates the decision will bring more than $10 billion in tax revenue to New York City over the next 20 years. In addition, Amazon says it has agreed to donate space on its campus for a tech startup incubator and for use by artists and industrial businesses, donate a site for a new public school, and will also create “infrastructure improvements” and green spaces. Mayor Bill de Blasio and Gov. Andrew Cuomo lauded Amazon’s decision. Amazon said it is receiving $1.525 billion in incentives from New York for the move. For the next 10 years, that will include a tax credit of $48,000 for each of the 25,000 jobs that will pay more than $150,000. The Empire State Development Corporation is giving a cash grant of $325 million based on the square footage of buildings Amazon will occupy in the next 10 years. The incentives will be provided to Amazon incrementally, based on job creation and occupancy targets. Amazon will also apply for additional incentives through New York City’s Industrial & Commercial Abatement Program and New York City’s Relocation and Employment Assistance Program. Further, New York City will provide funding through a Payment In Lieu Of Tax (PILOT) program. That will be used to fund “community infrastructure improvements” developed through input from residents during the planning process. “We’re going to to get more transit, we’re gong to get more shops, we’re going to get more restaurants. I’m thrilled,” said Long Island City resident Zane McDonald. Alvarez lives in Queensbridge Houses, the largest public housing complex, which is just blocks away from where the new headquarters is expected to go. Many have expressed concerns about how it could impact housing, commuting and infrastructure. Ginaris and City Council Member Jimmy Van Bramer are joining forces in the fight against Amazon, saying the city and state are giving up too much to the tech giant. 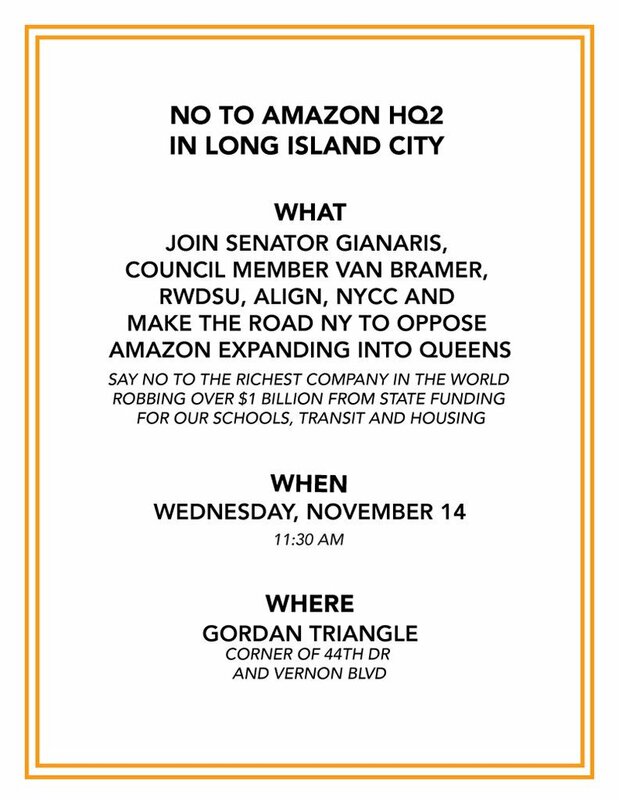 Van Bramer said he would hold a news conference to oppose Amazon’s move Wednesday. Incoming Rep. Alexandria Ocasio-Cortez, who will represent the adjacent congressional district, took to Twitter to sound off against the incentive package. “Shuffling working class people out of a community does not improve their quality of life,” Ocasio-Cortez tweeted.